My friends and I have been trying to get to Penn’s Cave for three years now. We’ve been to Crystal Cave and Lost River Caverns in Pennsylvania, Seneca Caverns in West Virginia, and Luray Cavern in Virginia. We’ve learned about stalactites and stalagmites, cave bacon, frozen waterfalls, cave draperies and fried eggs. We’ve seen columns and straws and flowstone. We’ve learned how dark it gets in a cave when the lights go out, and we’ve endured just about every bad joke a cave tour guide could come up with. 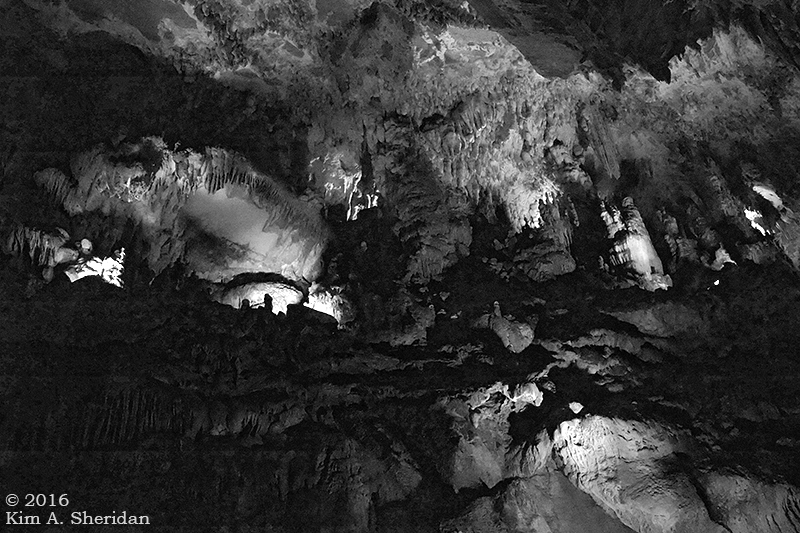 Luray Cavern pretty much spoiled me for any other cave experience. 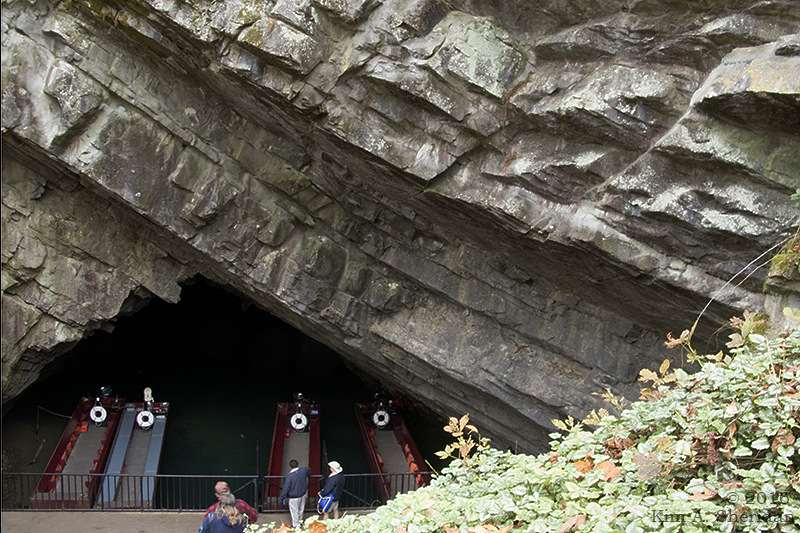 But Penn’s Cave, in the center of Pennsylvania, looked unique – an all-water journey through the cave in a boat. I mentioned it in my post about Crystal Cave three years ago; we’ve been talking about going to see it for a long time. At the end of October, we finally made it. Down a long flight of stairs to the cave we went. A fleet of flat-bottomed boats awaited. These proved to be really tippy as the cave tourists came on board. Our boat was also packed pretty tight. Turning to take photos was a challenge, and although the boat ceased to rock when it got underway, it was a far from motionless shooting platform. As if shooting in a dark cave wasn’t hard enough! There were fish in the water. Trout, of some sort. I know next to nothing about fish, unfortunately. I do know that’s a fish swimming there in the foreground of this photo. 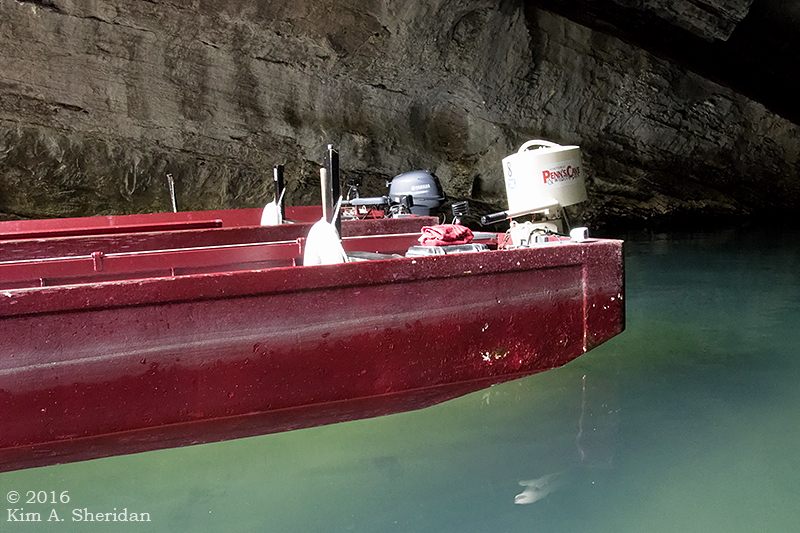 The waterway flowing through Penn’s Cave is Penns Creek. Named for William Penn’s brother John, one of its sources is a spring in the cave. 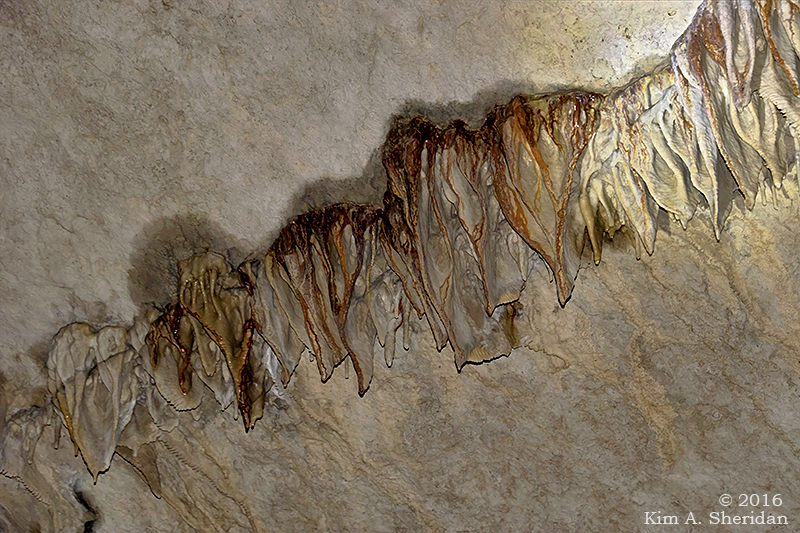 Cave curtains, one type of formation typically found in caverns. All caverns are caves, but not all caves are caverns. Wait, what? Any cavity in the ground large enough that some portion does not receive sunlight is a cave. 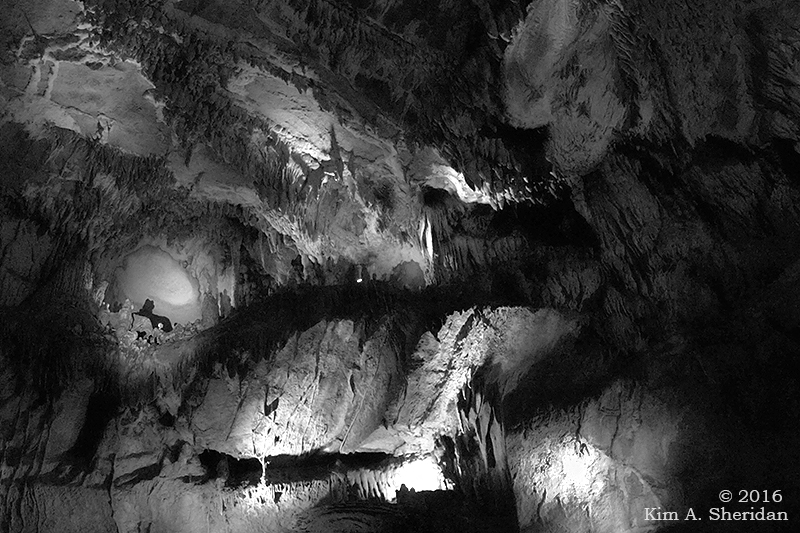 A cavern is a specific type of cave formed in soluble rock and decorated with speleothems. A speleothem is a cave formation. You don’t remember learning all this from the Wild Edge three years ago? Read it again here, there will be a quiz later. The ceiling of Penns Cave. The scale is lost in this photo, but this room was huge, and the ceiling far away. Like every cavern I’ve toured, the formations have names. Fittingly, there’s the Nittany Lion. The Statue of Liberty. The Straits of Gibraltar was a narrow passage with rock angling in on both sides. We had to duck. The light at the end of the tunnel. Penns Creek exits the cavern into a small man-made lake called Lake Nitanee. 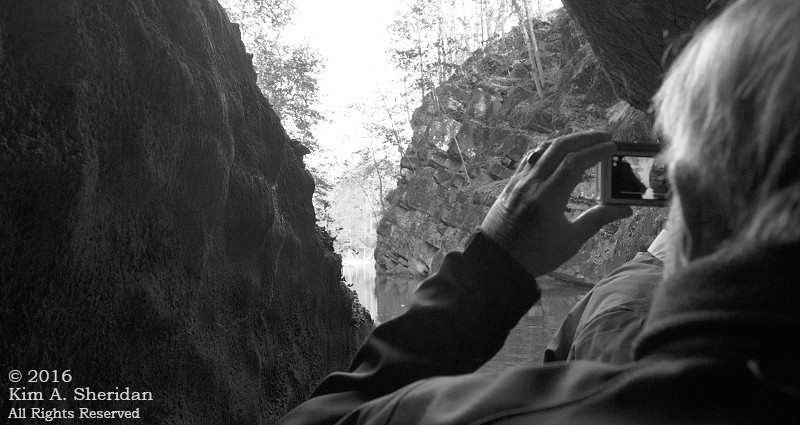 Looking over Don’s shoulder as we approach Lake Nitanee. 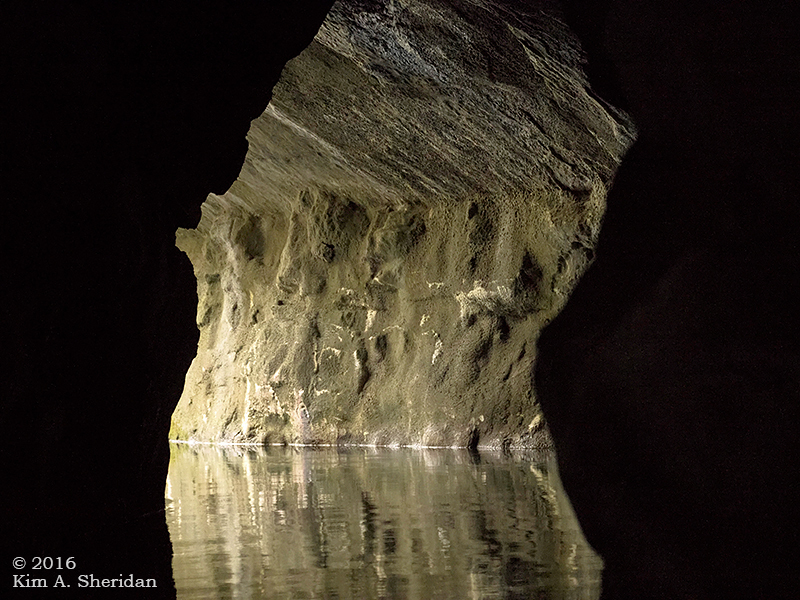 After a short cruise, we turned around and returned through the cavern to the entrance. Back on top of the earth. The surrounding area is mountainous and agricultural. 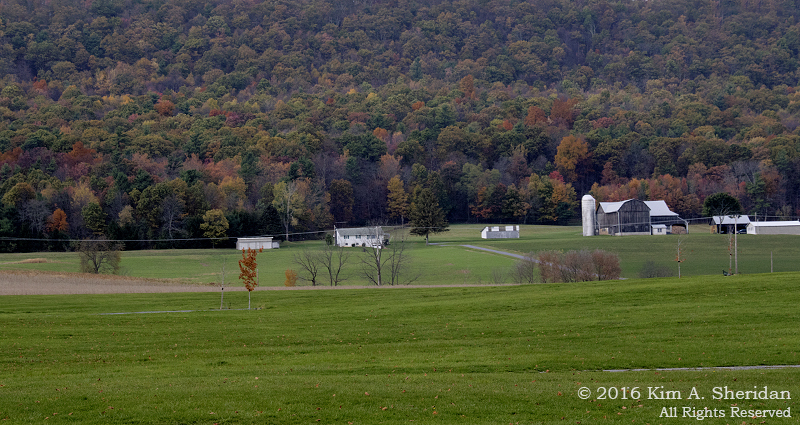 Penn’s Cave offers a Farm, Nature & Wildlife Tour. The park’s 1600 acres are home to longhorn cattle, bison, bighorn sheep, black bears, mountain lions, bobcats and wolves. 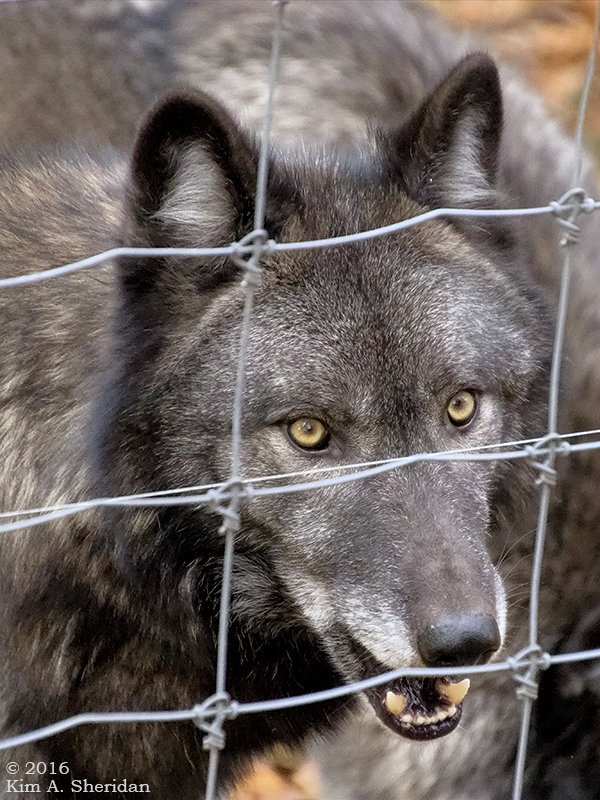 Some live in roomy fenced enclosures, like this handsome wolf. There are five wolves in the Penn’s Cave pack. Like all wolf packs, there’s a pecking order, with an alpha male and an alpha female. 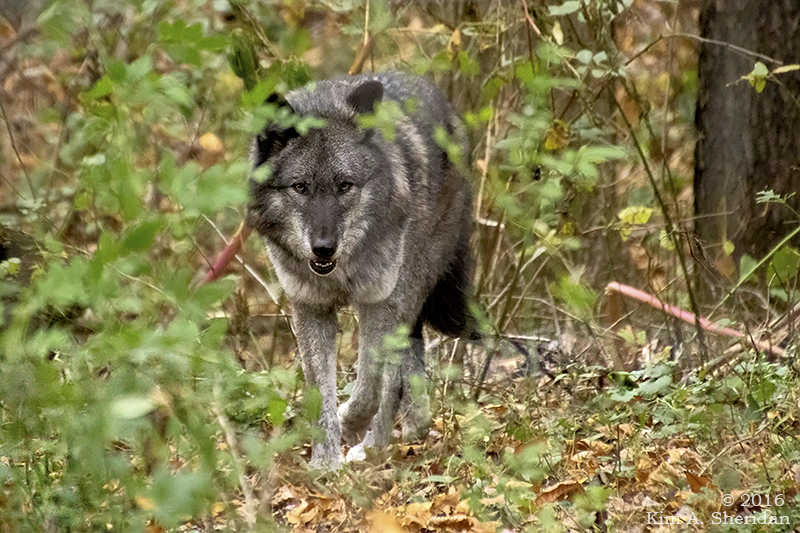 These wolves were hand-raised from pups, so they are accustomed to humans. You’re in Lion Country now, son. 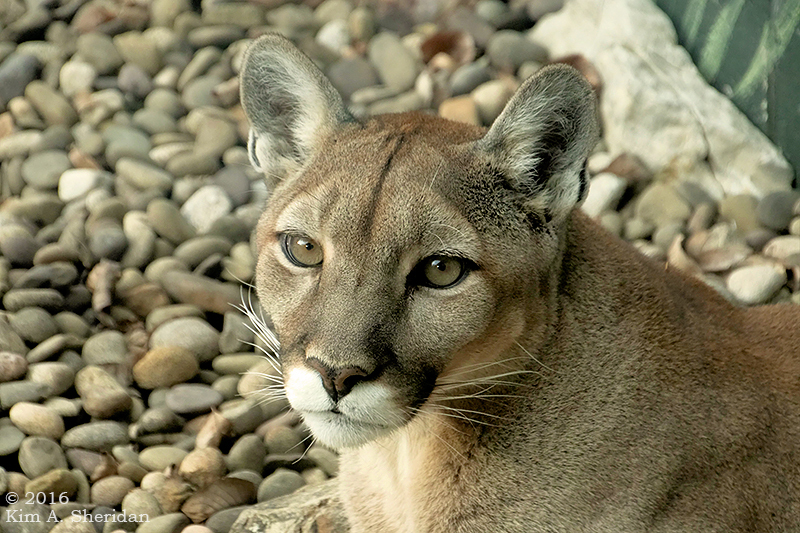 Penn State’s mascot, the Nittany Lion, is a mountain lion like this. She was housed in a zoo-like enclosure behind glass. When she heard my camera’s shutter, she turned and looked right at me for a long moment. Our last wildlife of the day, a red squirrel. Not behind an enclosure, but free and strolling across the replica mining sluice. 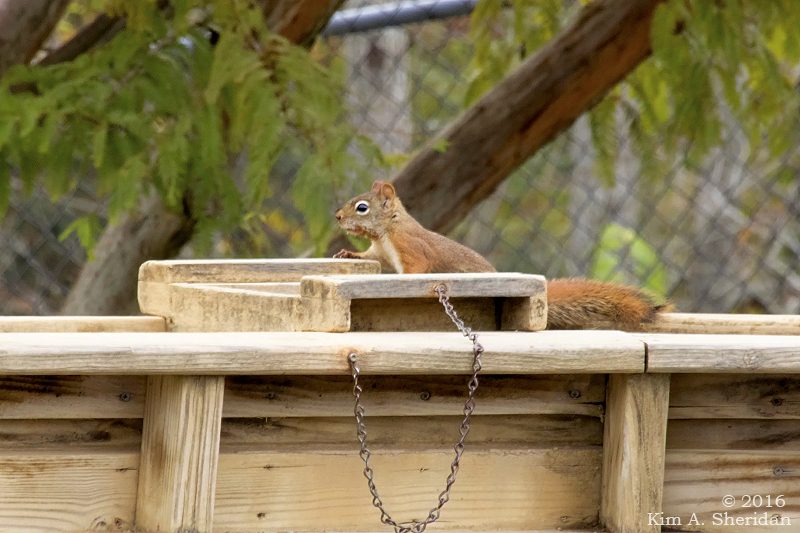 These critters make a call most unlike our familiar gray squirrels. Got your quiz answer ready? That’s right, speleothems form when rainwater and calcium carbonate form an acid that eats through soluble rock like limestone. As it drips, it leaves behind calcite deposits. My friends and I gave Penn’s Cave an A, too. Three years we waited, and it was well worth it.